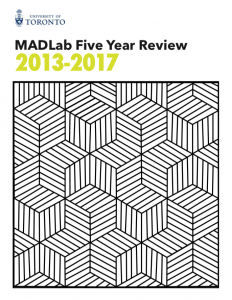 As we enter our fifth year at the MADLab, a review was commissioned to share our accomplishments. In this 11 page report, you'll find out about our activities, connections and success stories from our clients. The MADLab supports innovation in mobile app development and other emerging technologies at U of T through one-on-one consultations, workshops, talks, and events. The MADLab also provides app development services for U of T departments and outside clients, and has employed work-study students from U of T to assist with these projects. One of the MADLab’s key roles is to serve as a hub that brings people together. The lab does this by working closely with other groups on campus to host events and provide services available to all members of the University of Toronto community.